Play your part in a gripping narrative: Enter a world where moral dilemmas and difficult decisions can turn android slaves into world-changing revolutionaries. Discover what it means to be human from the perspective of an outsider – and see the world through the eyes of a machine. Whose side are you on? Become a bleeding-edge prototype android, investigating crime scenes and disturbances across Detroit's humming metropolis. 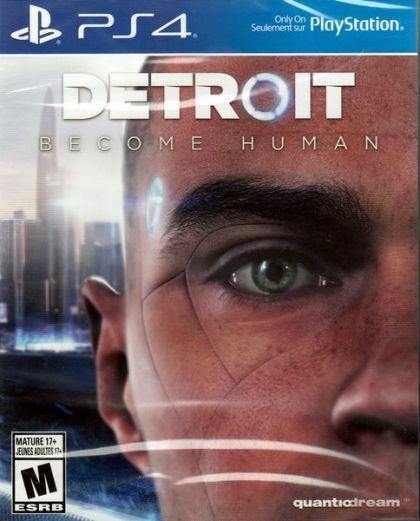 As special police investigator Connor, your mission is to assist the Detroit Police Department in tracking down deviants – androids that have broken their programming, abandoned their owners or turned to crime. Will you remain cool, calculating and ruthlessly analytical in your job? Or will you begin to feel empathy for the plight of your fellow androids and question the legitimacy of your mission? Where is the limit in the fight for freedom? Your chance to spark the fire that could lead to an android insurrection lies through Markus, another 'deviant' who has broken free of his programming. After escaping his master and joining a growing underground faction of dissidents, Markus takes charge in the organised liberation of Detroit's android population – but in sending a strong message to humans, will you take him on the path of pacifist disruption… or defiant violence? What does it mean to become human? See the impoverished and run-down side of Detroit through the eyes of a newly-manufactured android that has broken her programming. Classed as a deviant and on the run with an innocent girl she's sworn to protect, Kara is thrown into a brutal world where you must guide her to either accept the inequalities around her… or strive to do something about them in an effort to keep her surrogate child safe.